Instagram is also launching a #KindComments campaign, which extends beyond the application into meatspace. 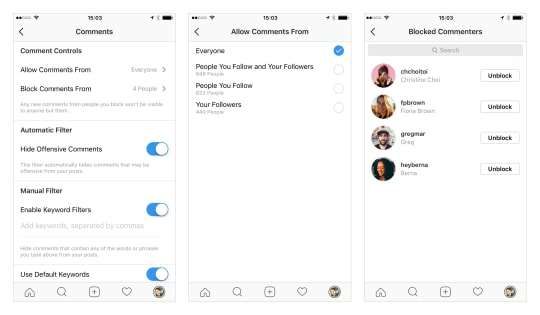 Instagram is introducing new tools to give more control to users over who gets to comment on their posts. There are now four categories of users that can comment on posts. The choices are "Everyone", "People You Follow and Your Followers", "People You Follow" and "Your Followers". Users can also block comments from specific accounts. This is in addition to an automatic filter, as well as a custom keyword-based filter. The options to allow comments from particular categories of users is only available to public accounts. However, those with private accounts can still choose to block comments from individual accounts. Previously, Instagram had introduced automatic spam filters in English, which has now expanded to Arabic, French, German and Portuguese. 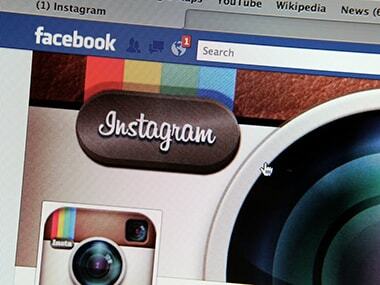 Instagram has indicated that the automatic spam filters will improve over time. The offensive comments are not scrubbed from the site, and users can turn the filter off to read all the comments at any time. The spam filter works in regular posts, as well as in real-time in live broadcasts. The user broadcasting the live will see a pop-up appear with a helpline, an option to reach out to a friend, and other tips and support. The helpline volunteer, which is the first option, is specifically trained to help people going through a difficult time. Instagram is also launching a #KindComments campaign, which extends beyond the application. Artists around the world are setting up murals encouraging kind comments in public spaces. This will encourage people to take photos next to the kindness walls. There are heart-shaped kindness stickers in the application. Both the stickers and the murals are designed by artists and meant to complement each other.